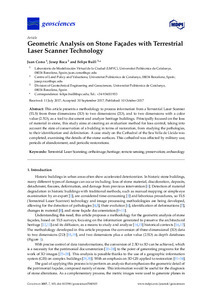 Corso, J.M., Roca, J., Buill, F. Geometric analysis on stone façades with terrestrial laser scanner technology. "Geosciences (Switzerland)", 1 Desembre 2017, vol. 7, núm. 4, p. 1-12.